I hope my reasons for choosing the word “transparent” in this context becomes clear by the end of this article. In my native language Turkish, among the intellectuals, the Turkish word for invisible (weak) personality “silik” is used as an insult as in “you have no ego, you are invisible, you are so boring.” Invisibility is not the same as transparency but I am taking a risk of being misunderstood by using the word “transparency” in the context of ego. In the context of spiritual practice the word “transparency” makes perfect sense, however. I hope this becomes clear. Ego works at the conscious and subconscious levels but it cannot function in the higher levels of the mind. Ego cannot function in the realm of intuition. This is why intuition develops when ego is more transparent. As ego becomes more transparent, the brilliance of the soul illuminates the mental plate more. As we continue to transform our egos into more transparent form we will become more and more intuitive. In the figures below, the outer (big) circle represents the Macrocosm which is the Cosmos (totality of physical, mental and spiritual realms). The center of the Macrocosm is called Purushottama which is the Cosmic Soul. 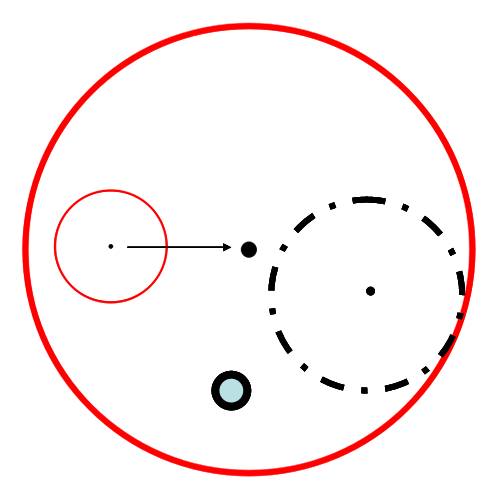 The boundaries of the smaller circles within the Macrocosm circle represent human egos. 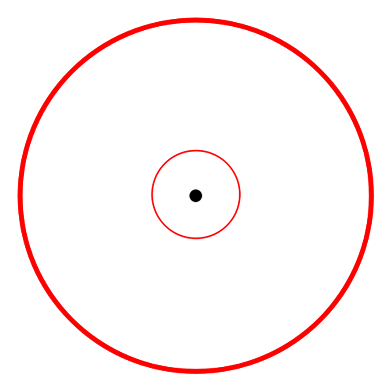 The smallest circle with the thick periphery and opaque inside represents the self-centered, egotistic individual. The periphery represents the ego. In this case the ego is thick and opaque. This prevents true vision. The big circle (black colored circle) with porous periphery and transparent inside represents a developed human mind with kind heart and expanded consciousness. The porous boundary of the ego allows for partial and limited views of the Macrocosm. The second circle (red colored circle) which is moving towards the Macrocosmic center represents a wise individual. This is not necessarily an intellectual or a philosopher (the periphery is not porous). This individual does not necessarily have partial visions of the Macrocosm but he or she is closer to Self-realization. The periphery of this circle is not porous but it is thin which makes the periphery transparent. The big circle with porous boundary will expand and eventually become as big as the Macrocosm circle. In other words, the individual mind will expand and cover the entire Cosmos after many lifetimes. This may be described as the transformation of ego by expansion of consciousness. This is enlightenment. This is Mukti. The individual becomes an integral part of the Cosmos and experiences the life of the Cosmos fully. He is liberated from the necessity of rebirth. The boundary of the big circle remains, however. The individuality still exists. The boundary (ego) disappears only when the centers of the individual and the Macrocosm coincide. If the centers of the individual and the Macrocosm are not coincident, the ultimate union remains as a goal. The circle with thin (transparent) boundary (a loving individual who practices spirituality) will move to the center and the centers will coincide. At that moment the soul unites with the Cosmic Soul. The boundary of the circle disappears. Ego is dissolved. This is liberation. This is Self-realization.